A.P. Moller – Maersk and tank storage firm Royal Vopak today have announced they will partner to launch an IMO 2020-focused 0.50% sulfur bunker supply operation in Rotterdam. The new venture will supply about 20% of Maersk’s global demand, enabling A.P. Moller – Maersk to deliver approximately 2.3 million mt per year, the parties said. On Friday VOPAK today said it will convert 500,000 cbm of capacity at its Europoort terminal for VLSFO, with Maersk now revealed as an anchor tenant for the modified facilities. "We trust that this initiative will put to rest some of the concerns the industry has on fuel availability as well as secure our continued competitiveness in the market," says Head of Maersk Oil Trading, Niels Henrik Lindegaard. 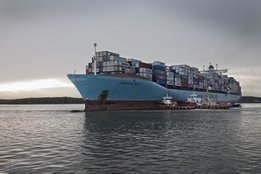 Some readers had tipped Maersk to make such a move following its early hardline stance against scrubbers as an IMO 2020 compliance solution.